Status: Contest finished on 20-02-2010. 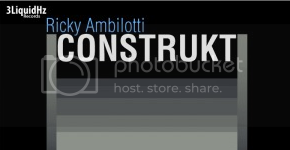 3 Liquid Hz Records is running a new remix contest, offering the chance to remix the minimal track “Construkt” by Ricky Ambilotti. The first place wins a SENNHEISER HD 25-SP II headphones, the release of the remix, a full contract with 3 Liquid Hz Records and 1 year of free promos. Good luck! fter the success of Ricky Ambilotti’s “Construkt”, 3 Liquid Hz Records is offering producers the chance to remix the track. Released at the end of April 2009, “Construkt” has been without a doubt, one of the most successful tracks released by 3 Liquid Hz Records. Staying in Beatport’s top 10 minimal chart for 3 months and being bought by an amazing number of Dj’s, Construkt has been supported and heavily played by Richie Hawtin, Dubfire, Chocolate Puma and many others, also being included in BBC’s Essential Mix. This is an amazing opportunity for all aspiring and established producers to join this success and become part of 3 Liquid Hz Records.